Welcome back glad to see you. Well the weather here is a little chilly this a.m. but suppose to warm up and then get some snow later today. The last couple days have been pretty nice. Have you been watching the Olympics at all....Canad women's hockey team is playing for the gold against the United states. Go Canada Go!!! I sure hope they win, it would be awesome. I'm a bit of a hockey fan, then the men's hockey team hopefully does well. Was a close game yesterday but the did win. Well I guess now to show you my card. This card is on the Whimsy blog this a.m. as well. 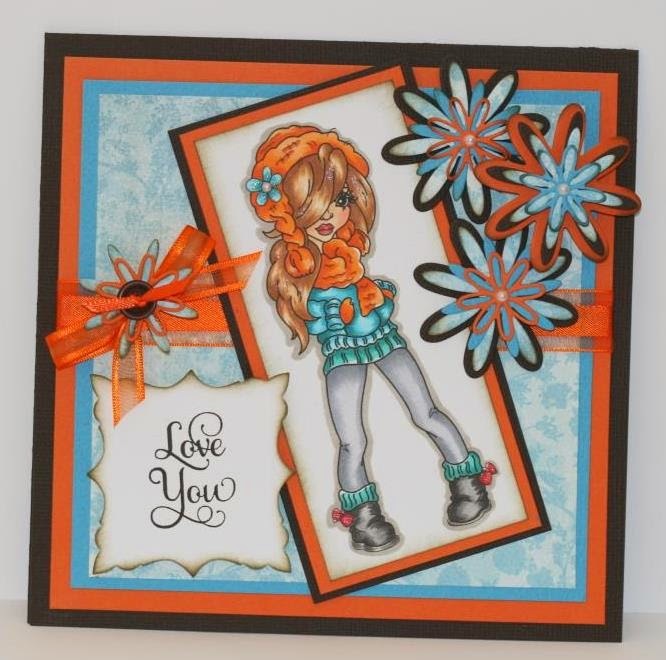 I made this card with a super cute digi called Olivia from Whimsy designer Marika Collins. I got my daughter to help me with the color scheme, she likes bright colors. I also just ordered some dies from the Whimsy store ...so now i'm playing with them. The two that i received that I used for this card are: Fancy Square Die and Layered Flower Die Set. I love both of them and they do cut beautifully.